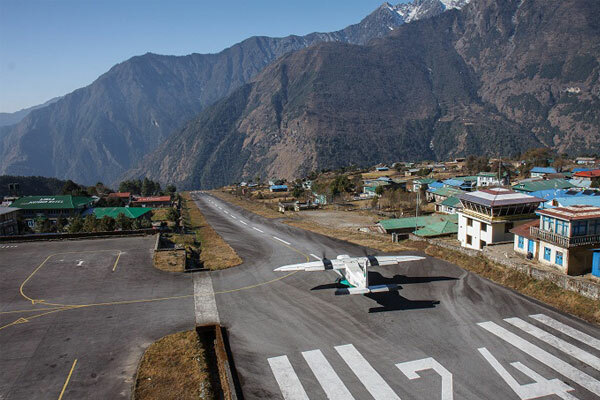 Everest Hight Passes trek starts after exciting flight to Lukla. The trail leads through the footsteps of famous mountaineers, the villages of Sherpa people, colourful prayer flags, mani walls and monasteries along the way. 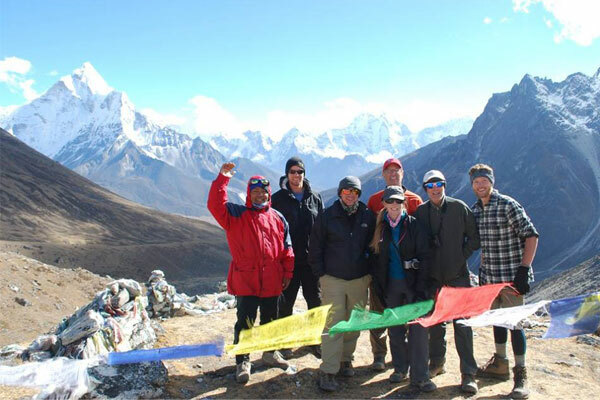 On this Everest high passes trek we will trek to Everest Base Camp with an ascent of Kongma La Pass, Kala Pattar, Cho La Pass, Gokyo Ri and Renjo La. After Base Camp we walk down to Lobuche and take the different trail to go Dzongla, over the Cho La pass, Gokyo & Thame valley rather than retracing the same trail back to Namche as per the standard Everest Base Camp itinerary. We climb Gokyo Ri in the morning for views of the Everest massif and we explore the numerous glacial lakes in the afternoon. After crossing the last Renjo La we descend into the Thame valley, this is one of the main trading routes with Tibet, and walk back to Namche. Welcome to Kathmandu, the capital and cultural hub of Nepal! We'll be waiting with a warm greeting and easy transfer to your hotel. Plan on an evening briefing on last-minute specifics about your trek and an early lights-out: you have a big day ahead. We'll have breakfast in Phakding before gearing up for the trek to Namche Bazaar, the biggest sherpa village in Nepal. Our trail takes us first over the Dudhkoshi River via a long suspension bridge, and then through a beautiful pine forest to Monjo, about two hours away. Soon thereafter, we will approach the entrance to Sagarmatha National Park for a brief permit check and then descend to Dudh Kosi River (spotting Mani stones along the way!) en route to Jorsale. Lunch will be served here, and then it's uphill to Namche. Our path along the riverbank is flanked by two crossings, one of which is the Hillary Suspension Bridge. 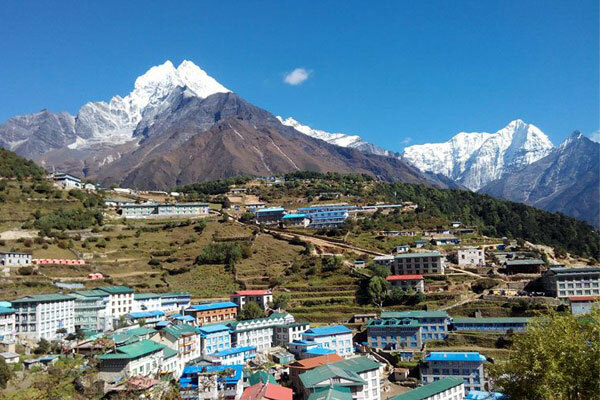 It's a tough climb up the hill to our resting place, but you'll be rewarded in Namche Bazaar with your first glimpse of Everest in its majesty. At this point, we take a well-deserved break! Today will be spent resting and allowing our bodies to become acclimatized to the lofty altitude. 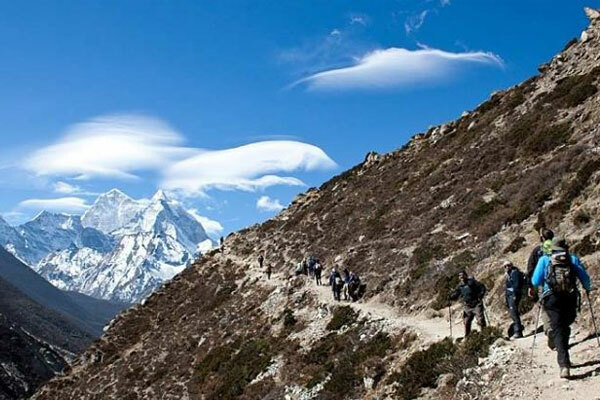 There's an optional 2 hour hike to Everest View Point, an uphill walk that will help speed acclimatization. Otherwise, spend the day exploring Namche Bazaar. Check out the Sherpa museum for an overview of the Sherpa culture and history of mountaineering. On Saturdays, the Hatt Bazaar is open for trading and an intimate look at the locals' marketplace. It is part of the larger Namche Bazaar, a shopping hub filled with all manner of trekking and mountaineering clothing and equipment. We begin today's trek on an easy trail to Phunki Thanga. From here we ascend towards Tengboche village which is home to the largest monastery in the Everest region. 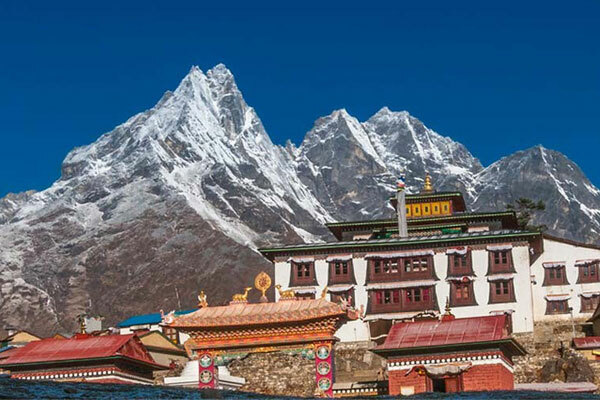 The monastery is located within the Sagarmatha National Park and provides panoramic views of the highest mountains on earth including Everest, Ama Dablam, Thamserku, Nuptse and Lhotse. We try to reach the monastery by 3:00 in the afternoon and may even be able to witness a religious Buddhist ceremony. We begin today's trek by walking downhill and pass through lush forests filled with birch, conifers and rhododendron trees. We continue our trek with views of Mt. Everest, Lhotse and Ama Dablam to keep us company. The picturesque trail dips down to Debuche, crosses the Imja River and takes us to Pangboche. While walking the upper Pangboche trails, we get a more pristine view of the Himalayas and Pangboche Monastery. We move ahead towards the Imja Valley, Lobuche River and ultimately climb up to Dingboche. The village is a beautiful windy settlement overlooked by chortens and prayer flags. Overnight in Dingboche. We begin today's trek very early in the morning to reach the highest part of the entire trip which is Kongma La pass. We can either take a trail over a hill which is to the northwest of Chhukung over the Nuptse Glacier moraines or we can walk back to Bibre and trek on the trail above the Niyang Khola. The top of the pass is marked by cairns and Buddhist prayer flags. The final descent from the pass is the most difficult part of today's journey. After climbing the moraine on the far side, the trail turns north through Khumbu Glacier which takes us to Lobuche. This is it! Our big day kicks off with an initial, relatively easy trek from Lobuche to Gorekshep. The subsequent, straight trail to Everest Base Camp is harder, involving rocky dunes and moraine, formed accumulation of unconsolidated glacial debris. On the way to our destination, we'll approach the famed Khumbu Glacier and icefall, located on the slopes of Everest. At the Base Camp, our goal, you'll have the chance (during the spring climbing season) to meet climbers attempting to scale the mountain's summit. Break out your cameras for unbelievable views of breathtaking beauty. As the afternoon sun starts to wane, we'll head back to Gorekshep for some much-needed rest and relaxation after a grueling and busy day. Altitude: 5,545m/18,192ft (Kalapathar) & 4940m/16,210ft (Lobuche) Walking distance: 12-13km (5-6 hours) - All distances and time estimates are approximate. We'll wake before dawn today to trek towards Kalapathar (which means "black rock") for a fiery, glorious sunrise over Mt. Everest. The day's first light will illuminate your spectacular view of Nuptse Nup, Changtse and Lhotse.This may be, of the whole journey, your most opportune moment to snap amazing pictures of Everest and its neighboring peaks. Afterwards, it's back to Gorekshep for breakfast and down in the direction of Lobuche, our nighttime stop. We climb Gokyo Ri today and enjoy views of the incredible mountain vista. We can also tour the fourth Gokyo Lake today which is only 3km north of the Gokyo Village. Next, continue trekking to the 5th lake. The view from 'Scoundrel's Viewpoint', located at the edge of the 5th lake, is astonishing. 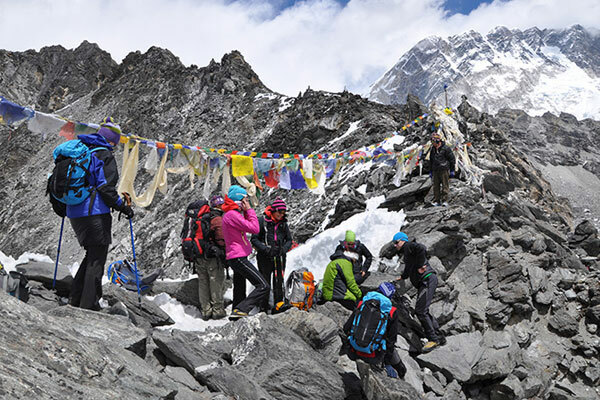 Cho-Oyu, Gyachung Kang, Everest, Lhotse, Nuptse, and Makulu mountains and the huge Ngozumba Glacier are ours to admire. We trek back to Gokyo and spend the night. We start the day early in the morning to complete the long day's trek ahead. Our trail moves alongside Dudh Pokhari (lake) for a while. We walk for around two hours before descending towards the Renjo La pass. On the way we are rewarded with extravagant views of the Himalayan and Rolwaling ranges and others. Views from the Renjo La pass are much like that from Gokyo Ri with the third Gokyo Lake and Gokyo Village beneath the gray smear of the Ngozumpa Glacier. We also get outstanding views of Mt. Everest from the top of the pass. Continuing on from the pass, our trail winds down a stone staircase and then moves over a loose scree to reach the south bank of Angladumba Tsho Lake. The prescence of ice on the trail while descending down can make our descent a bit hazardous. Along the way we see Relama Tsho and Renjo Lake. We walk down a narrow valley clogged with giant boulders to Lumde where there is a support lodge, but it is often closed. We walk almost for an hour from Lumde to get to Marlung on the east bank of the Bhote Koshi River. The flights to Kathmandu are usually scheduled for morning for safety purposes. After reaching the capital city, we have the rest of the day off to past the time as we please. We could take a rest in our hotel room or shop for souvenirs for our loved ones. In the evening, there will be a farewell dinner to celebrate the successful completion of your journey to the mountains.